The guild committed to a new project in 2015 (and it continues) to support the efforts of our City of Leominster. The Festival of Trees event, held in November, is a community display of decorated Christmas trees that have been donated by local organizations, businesses and groups. 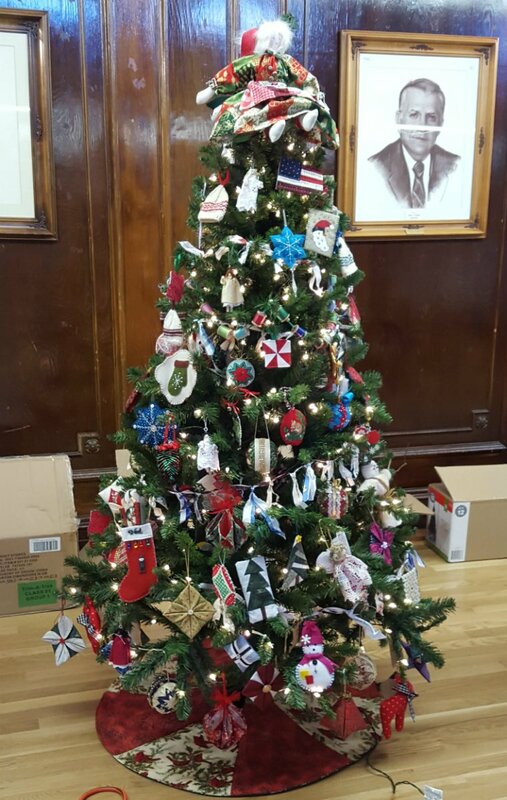 These trees are part of a silent auction with proceeds from the Festival of Trees benefiting the Mayor’s Fuel Assistance Program and Leominster events, such as the Winter Stroll, Summer Stroll, and Ladies’ Night Out. Guild members make and donate homemade ornaments to represent our guild. These are used to decorate the Quilter's Tree, which is given a unique name each year. You can make ornaments all year long and bring them to the guild meetings. For the Christmas 2018 Tree, the theme is Red & White. The fabric ornaments can be between 2.5" to 6" in size in any design you choose. Also, a garland of red & white yo-yos is planned. Yo-yos can be red, white, or red & white. The preferred size of the yo-yos is 1-3/4", the size made by the Clover Large Yo-yo maker. The deadline for the ornaments and Yo-yos is our November meeting. Please bring in ornaments and yo-yos and place them in the Ornament Basket at the front table. Need ideas? Visit www.favequilts.com/Quilted-Ornaments. This is a great way to use up those little scraps of fabrics you have left from a larger quilt project. The tree is set up just after Thanksgiving. In 2016, the name of our tree was “A Handmade Christmas”. Remember to mark your calendar and take a stroll through Leominster City Hall at the end of November or early December and view all of the beautiful creations. For additional information refer to the coordinator listed on the contacts page.